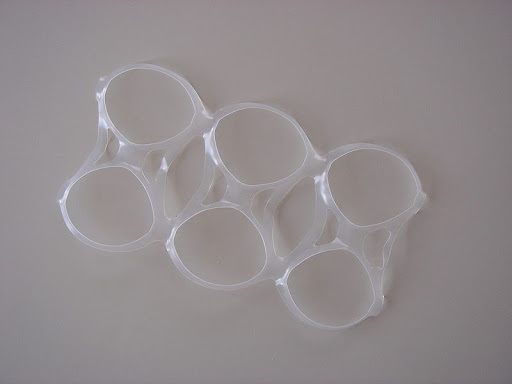 Six to eight plastic six-pack rings (a set of connected plastic rings that are used to carry six-packs of beverage cans or plastic bottles of soft drinks–”carrier rings”). Cut small pieces of masking tape (1”-2” long) and use to connect one set of six-pack plastic rings to another set of six-pack plastic rings. 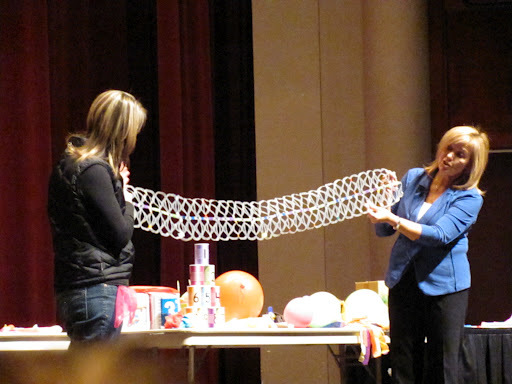 To make the net wider, connect another row of six-pack rings with masking tape above or below the first net. Most nets are two “carrier rings” wide. Tie pieces of cord to the top and bottom of the last hole on both ends. Attach the net to chairs, walls, coat racks, or trees. Use your Floppy Flipper to hit balloons, beach balls or foam balls over the net. Place nine bread bags in a row, alternating the top of one bread bag next to the bottom of the next bag. Cut small pieces of transparent tape and connect one bread bag to the next bread bag by taping the top of one bread bag into the fold of the bottom of the next bread bag in the row. When one side is taped, turn the row over and tape the bags together on that side. Continue to make 2 more rows of 9 connected bread bags. You will have a total of 3 long rows of bread bags. Trifold (fold into thirds) each row of 9 bread bags. Secure with tape. Lay the rows side by side and knot together at one end. Braid the three rows of bread bags together into a long jump rope and knot that end. Preschool children do not jump rope with individual ropes; however ropes can be used for several other activities. Balance ropes on body parts, or walk on top of ropes as a pretend balance beam. Put the ropes on the floor to represent different pathways, or to jump over. In my next post, I will share some favorite activities to do with your new homemade Bread Bag Jump Rope or any jump rope! For now, get started by encouraging your children/students to start recycling by saving lots of bread bags and six-pack carrier rings. Obstacle Courses = A"maze"ing Fun! Versatile and inviting, an obstacle course can be great fun for young children, and a course is easy to set up inside or out. Weather permitting, consider setting up the course outside. Fresh air can help energize brains and bodies! An obstacle course is an arrangement of physical challenges or tasks, using simple equipment, set in a line or route around an area. For young children, moving around, over, under and through an obstacle course promotes motor planning abilities, physical skills and movement concepts. Colored yarn, chalk, traffic signs or hand and feet prints can be used for the children to follow. Depending on the age of the children, start with 4 to 6 tasks or events that make a simple yet challenging course. Spread out the obstacle course as much as possible. Adapt, add and change the course to fit your location and abilities of the children. Before children attempt any obstacle course, ask them to watch as you or a child demonstrate the “how-to’s” (verbally describe directions for each task). Next, line up everybody behind each other at the start of the course and tell them to follow the leader through the course while you describe the physical challenges they are attempting. Emphasize that the obstacle course is not a race and they should not speed through the activities. The teacher or adult leader should stress to the children to keep some space between them. If a “traffic jam” does occur, tell the children to please wait patiently while the person in front of them completes the challenge on the equipment before proceeding ahead. Having a theme or focus for an obstacle course provides structured physical activity for children because it is purposeful play with a clear goal. An all-time favorite is the “The Super Daring Obstacle Course.” It’s adventurous because of the “maze” of obstacles and the “perilous dangers” the children are challenged to avoid by correctly maneuvering through the course. “Dangers” are pretend and explained with great fanfare, such as the “quicksand” area or the “bottomless swap.” The more creative and imaginative the adventure, the more the children will love it! 1. Start–place a pole, rope or piece of clothesline between two cones to make a crossbar for jumping over. Place a hoop on the ground on the other side of the rope or crossbar for children to jump into. Children jump over the “flaming” rope/bar and land with two feet in the hoop. 2. Jumping Pattern–place 4 hoops in a hopscotch pattern. Children jump with two feet into the first large hoop; straddle jump (feet apart) into the medium hoops placed side by side; end with two feet together again in the last large hoop. 4. Helpful Turtles–place 4 to 6 spot markers, Hop Around Steps or Balance Pods in a row 6- 12” from each other. Encourage children to step or leap from one spot marker (shells of turtles to help them avoid the “quicksand”) to the next as they travel on their adventure. 7. Stop–place a tumbling mat several feet away from the last cones of the Perilous Path. Children run to the mat and fall down on it or log roll to the end, survivors of The Super Daring Obstacle Course! As I once heard a child say, “The obstacle course is THE BEST thing I like at school!” It’s a wonderful thing for preschool teachers and early childhood caregivers to include as part of physical activity or movement programs.